The technique called scalp micropigmentation is aimed at simulation of hair follicles ,which will gives it a look of shaved hair, covering scalp scars and improve hair density. This method is a perfect solution for balding men and women. Tian Permanent Makeup Studio introduces Hair Follicle Simulation treatment performed by professionals with over 10 years of experience worldwide. The technique is truly revolutionary because instead of a regular tattoo machine with one needle, the procedure here is performed by the NPM roller. NPM roller is made of 56 needles and has a unique shape thanks to non-repeating distance between needles. Together with a ORON 57 machine or ORON 60,which is powerful enough to assist the roller with the help of injecting pigment into the scalp, the roller is able to simulate shaved hair incredibly realistic without spending a lot of time for a procedure. The uniqueness of NPM roller is in saving a lot of time by reducing it from 8 hours to only few hours. Usually, procedures performed by one needle machine take about 8 hours or broke into 3-4 procedures, 2 hours each. Normally tattooed hair will last about 2-3 years. After this period the pigment will start to fade and it is recommended to do a touch up. NPM color collection offers mineral based, non-allergenic colors which are long lasting and has outstanding quality. It is also worth to mention, that NPM pigments have a wide selection of colors, so you can be sure that when the shade chosen right, your hair will look remarkably realistic. The procedure is considered as tattooing, so it will be a slight discomfort, but it is not pain. Besides, a technician will use numbing gel prior to treatment to avoid this discomfort. The best aftercare is to keep area dry as much as possible the first week after treatment and use a healing balm. Who is a candidate for HFS? Also people who had to go through chemotherapy in the past and lost some or all hair often choose this treatment to get more confidence. It has been a massive increase in the hair follicle simulation procedure recently due to popularity of the shaved head look. 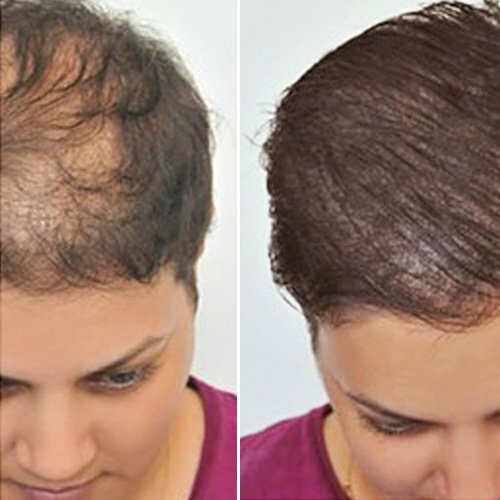 Generally speaking both, men and women can benefit from this procedure by getting permanent irresistible look of their hair without a cost of the hair transplantation.